In this example of condensed narrative, many events from Christ's Life, known as the Passion, are located within a sophisticated landscape setting. 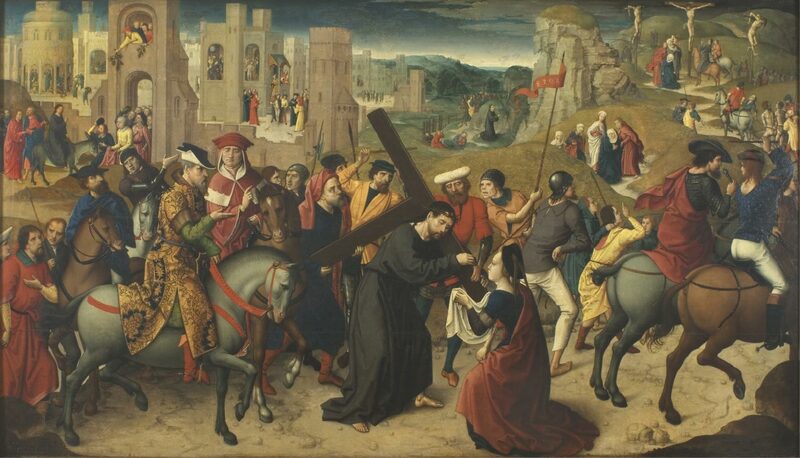 The central scene shows Christ Carrying the Cross to Golgotha, the site of his crucifixion. Veronica, a compassionate witness to his suffering, is shown about to wipe his face with her handkerchief. A miraculous image of Christ's face was preserved upon this cloth. Other scenes in the background include, from left to right: the Entry into Jerusalem; Driving the Moneychangers from the Temple; the Last Supper; Christ Crowned with Thorns; the Flagellation; Christ Presented to the People; the Agony in the Garden; and the Crucifixion.